The grand solution to all our problems lies in the human race comprehending the concept of time. I can prove it, if only I could spare the time. Fracturing time may have been the biggest human error of all times. Could anyone not agree with Plautus when he condemned that “wretch who first . . . set up a sundial in the market place to chop my day to pieces.”? And what would is your blog url, so I can check it out? Have you seen Goya’s ‘The Dog’? 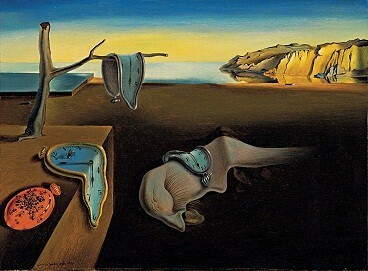 As evocative a painting as Dali’s. Good blog you have here!! Have no reason really. Was traveling for a while, and couldn’t update for a long time. But now I am back, time is not really an issue, and have even been writing, don’t feel like posting anything anymore. Guess it will pass. or maybe not. There is this called ‘Faster’ that takes a look at what we have done to time. Have you seen it? Did I miss the Venice pictures or you didn’t post it? Hi Mridula, what is the ‘faster’? sounds very interesting – is it a book?